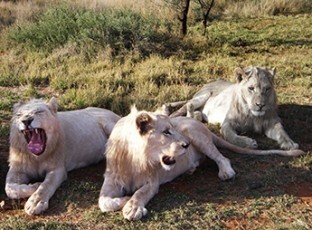 Wiets Safaris has exported several white lions to the Paradise Wildlife Park in London, UK as well as Italy. The white lion is a rare colour mutation of the Kruger subspecies of lion (Panthera leo krugeri) found in some wildlife reserves in South Africa and in zoos around the world. White lions are not a separate subspecies and are thought to be indigenous to the Timbavati region of South Africa for centuries, although the earliest recorded sighting in this region was in 1938. Regarded as divine by locals, white lions first came to public attention in the 1970s in Chris McBride’s book The White Lions of Timbavati. Up until 2009, when the first pride of white lions was reintroduced to the wild, it was widely believed that the white lion could not survive in the wild. It is for this reason that a large part of the population of white lions now reside in zoos.